This article is about the race course that appears in Mario Kart 8 and Mario Kart 8 Deluxe. For the race course from Mario Kart: Super Circuit with the same Japanese name, see Sky Garden (GBA). Cloudtop Cruise is the first race track in the Special Cup of Mario Kart 8 and Mario Kart 8 Deluxe. This course mainly takes place on a giant beanstalk (similar to Sky Garden) and on an airship (like Airship Fortress). 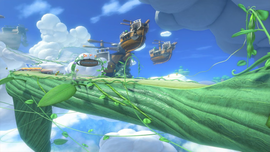 Several of Bowser's airships are seen flying in the background. Like several other courses, the music for this course have two different variations: the first variation is orchestral and plays when the players drive on the cloud and beanstalk sections, while the second variation is a rock arrangement that plays when reaching the thundercloud section. The ending portion of both variations uses parts of Sky Station Galaxy and Gusty Garden Galaxy's music from the Super Mario Galaxy games. The course's music also reappears as an arrangement in Super Smash Bros. for Wii U and Super Smash Bros. Ultimate on the new Mario Circuit stage, which combines the two variations. The course as seen from the starting line. The race starts on a giant beanstalk. Shortly after there is a ramp with some Item Boxes on it, and there is a Bowser Balloon that characters can bounce on, similar to the mushrooms in Mushroom Gorge from Mario Kart Wii. The racers will then continue racing on a cloud. Later, they come onto an airship, where the player encounters two paths, both of which meet up right before a cannon, which launches the player to a anti-gravity metal track inside a storm cloud. On the track, there are many boost panels, but once in a while, lightning will strike them, which the racers have to avoid or else they will get knocked out. This section then ends to start a gliding section, which touches down on a giant stone ? Block, a reference to how Beanstalks grow out of ? Blocks in Mario games. There is just one more right turn before the finish line. Players can bounce on the second Bowser Balloon without using a Mushroom. Near the end of the lap, players can jump off two big leaves, cutting off the final corner. The staff ghost for this track is Baby Rosalina in the Biddybuggy. The times to beat are 2:26.347 in Mario Kart 8 and 2:19.568 in Mario Kart 8 Deluxe. In Mario Kart 8 Deluxe 200cc, the staff ghost is Bowser Jr. with a time of 1:44.120. A Mario sprite can be seen hidden in one of the clouds. The first portion of the track music plays in amiibo screens in retail stores. This page was last edited on December 27, 2018, at 19:34.